There has been a steadily growing stream of low-budget Australian sci-fi over recent years, helping to complement our strong horror output. With streaming finally making some decent headway, that looks set to continue. That is the path that Infini (2015) has taken, with a streaming focused release, coupled with a few select cinema screenings, helping to get the film out there. 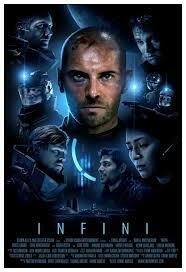 Infini takes a relatively old fashioned approach to the genre. Back story is conveyed via text onscreen, which actually functions quite well. Much better than if they had tried to flesh out the timeline more, which would have just stretched the budget too thin you suspect. The text states that in the 23rd century poverty is overwhelming, with the poor forced out of necessity to take low paying jobs and exceptionally dangerous jobs. Many are subjected to slipstreaming, which is a highly dangerous form of transport, that more or less looks like teleporting. This is all simple, but well constructed worldbuilding that allows the film to jump more or less straight into the action of the plot, after a brief moment lingering on the main character’s family life. The story that follows is a nice mishmash of common sci-fi elements, themes and sub-genres. There’s an isolated planet in deepest darkest (coldest) space, a rescue team and a crazy person. It’s very survival horror, with more than a dash of influence from zombie films too. The script does get a little scrappy in the final act when it tries to ramp up the delirium of the characters and the situation, but that is sort of saved by the unlikely element of sound design. The cacophony of voices in the heads of the characters does a much better job of conveying the descent into chaos that is taking place. Visually, the filmmakers have done a really good job here. Nothing ever looks cheap and they manage to render a slick looking dystopian vision really well. It’s apparent that they’ve used a fair few ‘household’ style items (corrugated iron seems to feature a fair bit), which they manage to combine into sets that well and truly serve the purpose of the film, which is especially true on the isolated planet. Likewise the CGI is really good in the film, mainly because they don’t use that much, focusing more on practical effects. But when they do throw in a bit of CGI, generally to flesh out an expansive background, there are none of those distinctive cheap looking effects so common in sci-fi. Actually I barely even noticed the CGI at all, which is about the biggest compliment you can pay it. On the acting front, the film is populated with a relatively diverse cast and a bunch of Aussie character actors. Daniel MacPherson, best known for appearing on a fair few soapies out here is in the lead role and does it well. 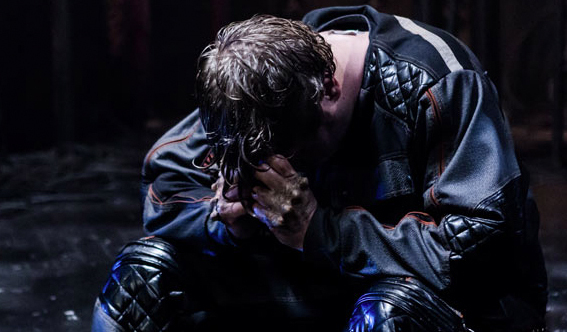 He has enough gravitas, at least in a genre sense, to buy into him as a hero. There is the odd patchy performance, but they thankfully never take you out of the film for too long. Related beermovie.net articles for you to check out: Patrick and The Infinite Man. Primordial ooze FOR THE WIN!!! Lol. Nice review man, saw this title posted over at Epileptic Moondancer as well. Seems like this is a film finding an audience quickly. Always exciting. Cheers man. Yeah, it seemed to get a decent amount of buzz when it came out here. They really pushed the VOD release hard which is kinda rare. Worth a look if you’re a sci-fi fun.